Offer Details: Albertina Wine Cellars conducts vineyard tours by appointment. Call 707.744.1475 or email , give us your preferred dates with few days notice. The Zmarzlys own and operate the mountain vineyard. All of our wines are estate bottled, with hand-picked grapes from our own mountain vineyard. The thin soils of our mountain vineyard force the vines to continuously struggle, producing smaller berries with more intense flavors and color. The low yields of 3 tons per acre result in concentrated fruit flavors. 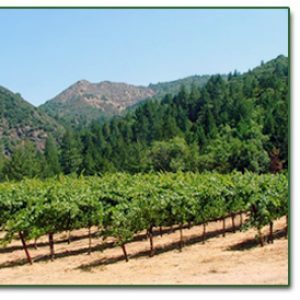 The Zmarzly owns and operates the mountain vineyard, employing Greg Graziano and Penny Gadd Coster as winemakers. Albertina Wine Cellars does not have a tasting room but offers wine tasting in the vineyard to guests, by appointment. The oak-studded knoll in the middle of the vineyard offers 25 miles views of the mountains and valley below. It is a terrific place to sit back and taste the wine. Schedule an appointment a few days ahead of time by phone at 707.744.1475 or email. We will confirm and send directions to the vineyard by email. Albertina Wine Cellars conducts vineyard tours by appointment. Call 707.744.1475 or email , give us your preferred dates with few days notice. You are invited to have a picnic in our vineyard during designated weekend dates in May, June, July, August and September. You bring your picnic, and we’ll supply the wines and refreshments. Have your picnic in the middle of our vineyard on an oak-studded knoll, with 25 mile views of the surrounding mountains and valley floor below. Reservations are required at least 5 days ahead. Call 707-744-1475 to make a reservation.